« Institutions vs. I-banks: who’s better? Companies continue to swim in what could be turbulent waters, especially management teams struggling with weak performance or caught in an economic riptide. And then there are what some folks call the sharks. Shareholder activists are just as active in 2008 as last year, according to FactSet Research Systems Inc., a data-crunching firm. 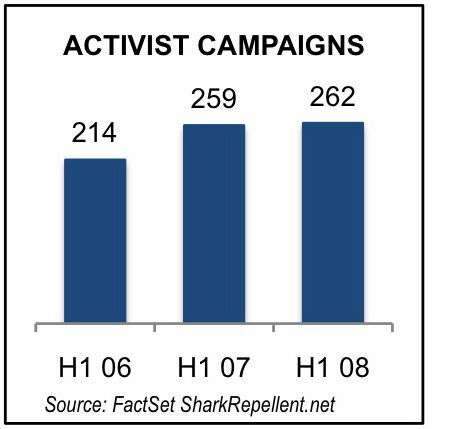 Activists unleashed 262 campaigns, including 53 formal proxy fights, in the first half of 2008. It’s virtually unchanged from 259, with 55 proxy fights, in the first half of 2007. According to Financial Week (July 28-August 4), “A handful of hedge funds continue to pick the most fights.” Eight hedge funds are responsible for 30 percent of the battles, with Carl Icahn and Philip Goldstein’s funds at the top of that list, FW says. This entry was posted on August 9, 2008 at 12:13 am and is filed under Activist shareholders. You can follow any responses to this entry through the RSS 2.0 feed. You can leave a response, or trackback from your own site.